One of the most famous works out of Van Gogh’s ‘Sower’ paintings. He made the first one in 1883, and six others after painting this in 1888. 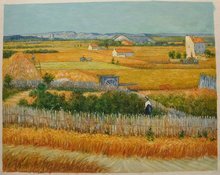 "It may not be an original Van Gogh but it looks amazing and is affordable. We had fantastic customer service and received the package in a very timely manner. We plan to order more paitings from the Van Gogh Studio. Thank you for adding beauty to my walls! 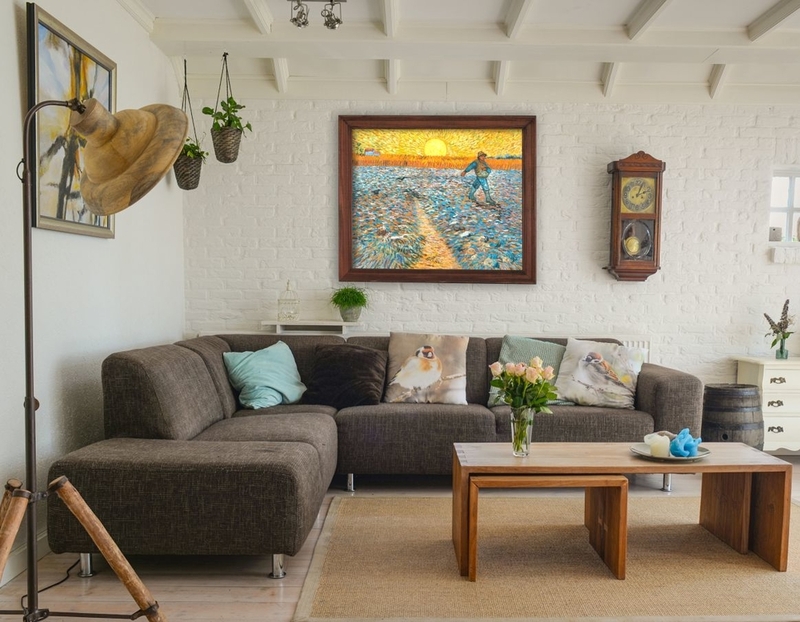 - Dru"
We will deliver a hand-painted Van Gogh reproduction that looks and feels just like the actual painting. 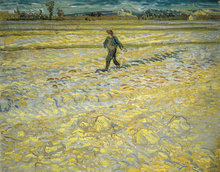 The Sower, painted by Van Gogh at Arles, in 1888, is widely considered to be a representation of The Last Judgement in the gospel of Matthew. It speaks about how God sows the seeds of the spirit in the soil of humanity and returns on the last day to reap the harvest. There are two ‘Sower’ paintings which are quite similar in terms of the perspective used by Van Gogh. Both have the sun as the primary source of light, but at different times of the day. This one here shows the sun being high in the sky like it is at noon. The other one, titled ‘Sower in the setting sun’, as the title suggests was framed just before sun down. Both paintings show a farmer sowing seeds for the next harvest. The empty fields signify that the previous crop has already been reaped, thus reiterating the fact that life is an endless cycle of sowing the seeds and reaping the benefits. Van Gogh’s fascination with celestial objects has been demonstrated in numerous paintings. Here, the sun looms over the farmer, almost as it were something to be worshipped. 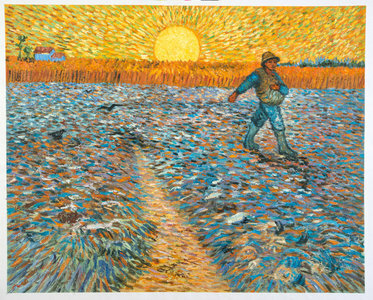 The one thing that no one can miss while looking at ‘The Sower’ is a rhetorical fencing match that goes on between the sun and the ploughed field which makes for almost 3/4th of the painting. It is also important to mention that after his tryst with Portraits in Paris, nature began to take the spotlight in Van Gogh’s paintings. In fact, Van Gogh was always looking to interpret the nuances of ambient light in his own way. He once mentioned how the objective was to use his own colours to depict the scenes he saw. It was almost as if he couldn’t care less about what the actual colours were and was more interested in giving the viewer a sensory overdose of complementary and contrasting colours. We purchased this art online and had it shipped to the U.S.A. I have had so many compliments on how beautiful the colors and the quality of the painting. My interior decorator was very impressed with the high quality. It may not be an original Van Gogh but it looks amazing and is affordable. We had fantastic customer service and received the package in a very timely manner. 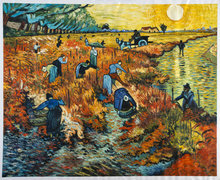 We plan to order more prints from the Van Gogh Studio. Thank you for adding beauty to my walls!